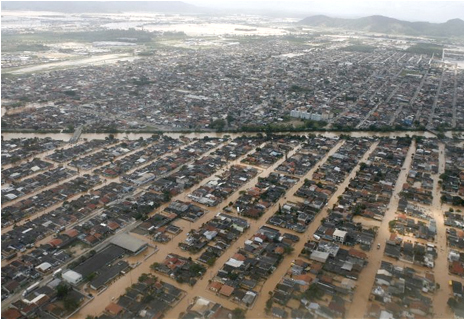 The climatic disaster in Santa Catarina over the course of this week has resulted in 97 people confirmed dead and 19 still missing. Over 78,000 people were forced to leave their homes, and overall 1.5 million people have been affected by the heavy rains, floods, and landslides in Santa Catarina. Six cities have been completely cut off, and roads have been closed off. Emergency workers have been using helicopters and boats to try to reach those left stranded. Supermarkets and other commercial establishments have been looted. President Luiz Inacio Lula da Silva signed a decree today to free up R$1.6 billion of funds the country keeps as reserves for disasters this summer. The funds will go to Santa Catarina's Civil Defense department and the Armed Forces, and to help repair roads and ports and provide medical aid. 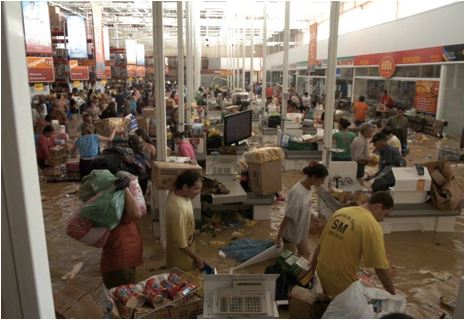 Accounts in several national banks have been made available for personal donations to rescue efforts in Santa Catarina. I have listed them after the jump. Over R$1.2 million have been collected so far. In an episode reminiscent of Katrina, the government is reported to have spent only 26% of the funds destined to the prevention of disasters and emergency measures with actual prevention efforts. In 2008, the federal government assigned R$2.4 million to Santa Catarina to be spent on preventive infra-structure, and over R$7.4 million to be spent on a relief efforts program, which means that the state was assigned three times more more to respond to disasters than it was to prevent them in the first place. I apologize for bringing such sad news on Thanksgiving Day. Bradesco S/A - 237, agência 0348-4, conta corrente 160.000-1. If any of you knows of an international organization taking donations, please let me know. Very sad. Do you know of a place people could donate to help? :( My heart goes out to all the Brazillian people. On thanksgiving we are taught to be thankful for all that we have, and surely times like these urge us to open our hearts. Is the Int'l Red Cross or other aid organizations taking donations?